Shortening, pie crusts, brownies and microwave popcorn could be partially exempt from a government phase-out of artificial trans fats - if the food industry gets its way. The Food and Drug Administration announced in June that it is requiring food companies to largely rid their foods of the artery-clogging fats over the next three years, calling them a threat to public health. But food companies can still petition to use them sparingly. The Grocery Manufacturers Association, the leading industry group for the food industry, said Wednesday that it is petitioning the FDA to continue the use of artificial trans fats in hundreds of foods, from tiny amounts in breakfast cereals to larger amounts in shortening and pie crusts. The food industry argues that the levels would not increase heart disease risk any more than naturally occurring trans fats from meat and dairy products. Food companies "have already voluntarily lowered the amount of trans fat added to food products by more than 86 percent and will continue lowering (partially hydrogenated oil) use to levels similar to naturally occurring trans fat found in the diet," said Leon Bruner of the Grocery Manufacturers Association. The fats are created when hydrogen is added to vegetable oil to make it more solid, which is why they are often called partially hydrogenated oils. Scientists say there are no health benefits to the fats, which are used in processing food and in restaurants, usually to improve texture, shelf life or flavor. They can raise levels of "bad" cholesterol and lower "good" cholesterol, increasing the risk of heart disease, the leading cause of death in the United States. 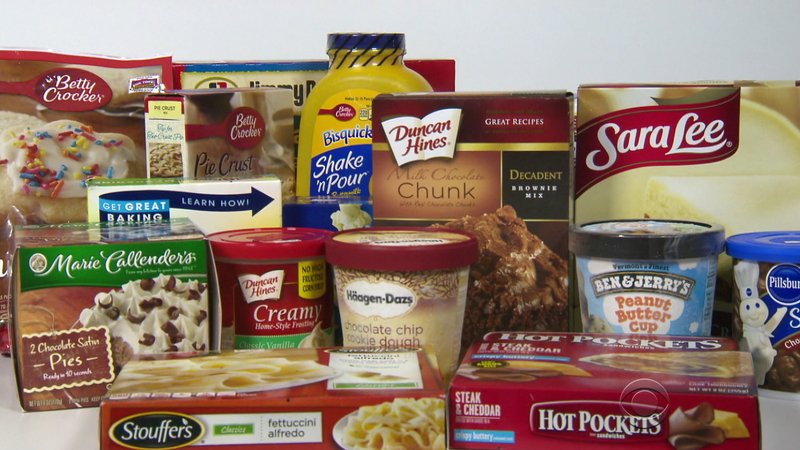 Many of the amounts requested in the group's petition would be less than a gram of trans fat per serving - a move that public health groups see as positive. "Their proposed limits would get rid of almost all of the very high trans fat levels, and that's very good," said Michael Jacobson of the Center for Science in the Public Interest. Jacobson said the amounts petitioned by the industry are still too high, however, since even low levels can be a public health risk. For shortening, for example, the industry is asking for 3 grams of trans fat per 100 grams of shortening. When translated into a typical serving size, that's less than half a gram per serving. The industry group is asking for a similar amount for microwave popcorn, one of the worst trans fat offenders. To phase the fats out, the FDA made a preliminary determination in 2013 that partially hydrogenated oils no longer fall in the agency's "generally recognized as safe" category, which covers thousands of additives that manufacturers can add to foods without FDA review. The agency gave food companies until June 2018 to phase them out. Trans fats are widely considered the worst kind of fats for your heart, even worse than saturated fats, which also can contribute to heart disease. Over the years, they have been used in foods that need solid fat for texture, or in those that need a longer shelf life or flavor enhancement. The FDA had no immediate comment on the petition.